Gennis, who is one of a nice stable of creators I follow who make amazing non-fiction comics (Andy Warner is another), and I was happy to read this one not once but twice. First, as it originally appeared on Matt Bors' The Nib and now again in a print edition. Subtitled, "Elective Surgery You Need Like a Hole in the Head," Emi takes this rather unusual subject and gives it a serious treatment. She allows the batshit insane concept to make its own unintentional comedy. Opening with the rather dramatic image of Hugo Bart Huges impaling his forehead, with blood spurting out from the wound, Gennis wastes no time explaining trepanation's long history, distilling a lot of information across two pages, Good old Doctor Huges does the bulk of the early narrative lifting along with Joe Mellen, explaining his views, and discussing those he influenced, including John Lennon. Moving from Huges to a man who believes in the healing power of trepanation, Randall W. Haws, Gennis takes us though Haws' research and beliefs. Then comes Dr. Benson Yang, doing his best Dr. Hibbard vs Dr. Nick impression, pouring cold water all over the theory of trepanation with his fun-ruining facts (not the least of which is that when you drill the hole, you're not even getting inside the brain's protective membrane). We finish with some of the hopes and dreams of those who like having a gap in their skull, and Gennis actually lets them have the last word. Haws gets to ponder if it's a chicken and egg thing, and in the end, he's right--it's not like he can undo it to know for sure. This obviously is a very brief overview. The mini is 16 pages, half-sized, so Emi's not going to have a lot of time to draw things out, so to speak. 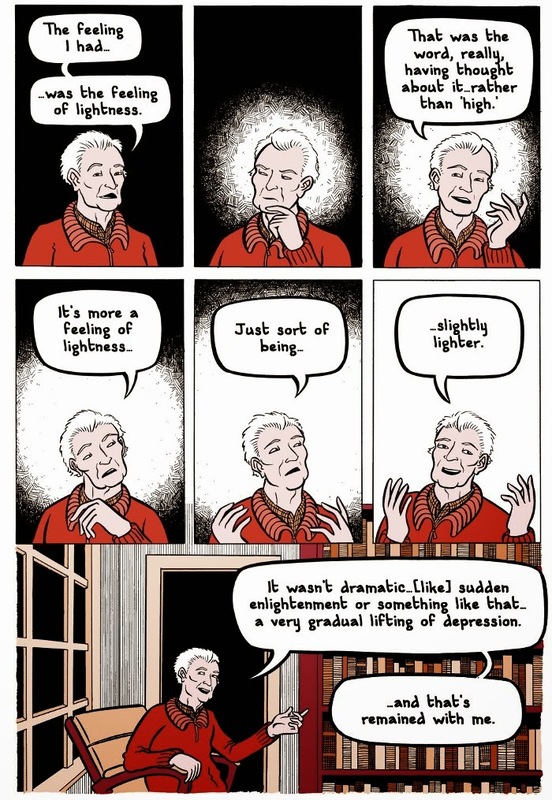 But that's what I love about her work; she knows how to boil down to visual essentials and not get lost in walls of text, a common problem for those adapting non-fiction (or fiction for that matter) into a comic. She picks out the most interesting things, like Lennon's dalliance with the idea, and uses those to build the story around. Gennis is also very good at using her backgrounds to help ground the talking. This feature, by its very nature, has to be a lot of discussion, and it would have been easy to go all Brian Michael Bendis. Instead, the characters come in and do things while they talk, whether it's show a procedure or a tool, or just their comfort with being trepanned. I like that Emi doesn't make the pro-trepanation folks look like idiots. They aren't cartoonish buffoons, but real people, even if they are probably out to lunch on the effects of skull-drilling. (One wonders if they also use leeches?) She also ensures that anything we see, if it's an operating table or an outdoor set piece, looks real. These illustrations are a part of the non-fiction, and Gennis acts accordingly. When I was a kid, I used to look up random things in the encyclopedia just to learn new ideas. For me, I can't be bothered with a 500 page brick on trepanation (and you know there's something like that out there, even for laymen). But I love finding out a little bit about a lot of things. 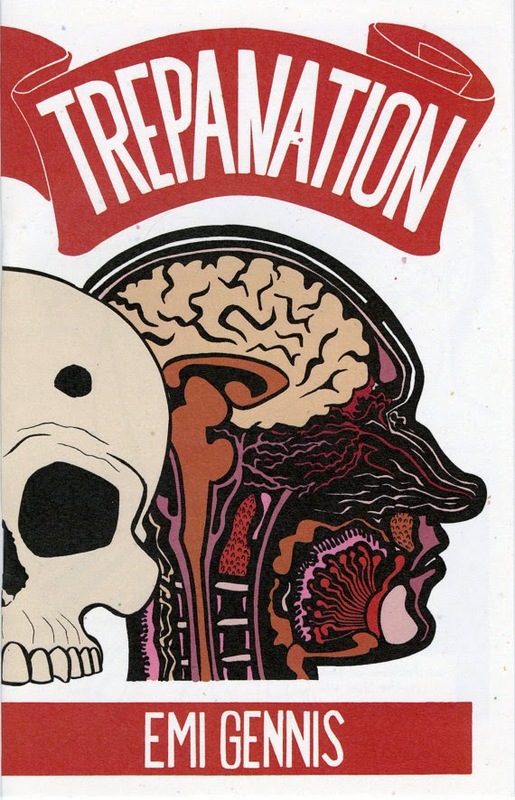 Comics such as Trepanation are perfect for me. If you like to gain knowledge while reading a comic, this is one you'll want to drill down and find for yourself. There's an online version, of course. But why not stop by Emi's shop and pick up a paper copy? That way she can make more of these lovely short comic pieces!